It had been months since he had seen his parents and home. The city skyline gradually came into sight after a long flat prairie drive. Suddenly he was passing the familiar landmarks as he entered the outlying district where he used to live. There was the drugstore where he had worked briefly, riding his bike in the deep snow delivering prescriptions. There was the bus stop where his girlfriend had tripped as they once ran for the bus. There was the hospital where his mother had worked and walked blocks to in winter in order to save busfare. There was the little hall where a September Saturday dance had once been and he had been introduced to all his friend’s grade 9 classmates from another school–opening up an entirely new world of amazing possibilities for him. There were the two streets where he had delivered papers for several years, the building his parents had found him in upstairs when at 5 he wandered off with some strange kids and they showed him how to box, complete with boxing gloves. 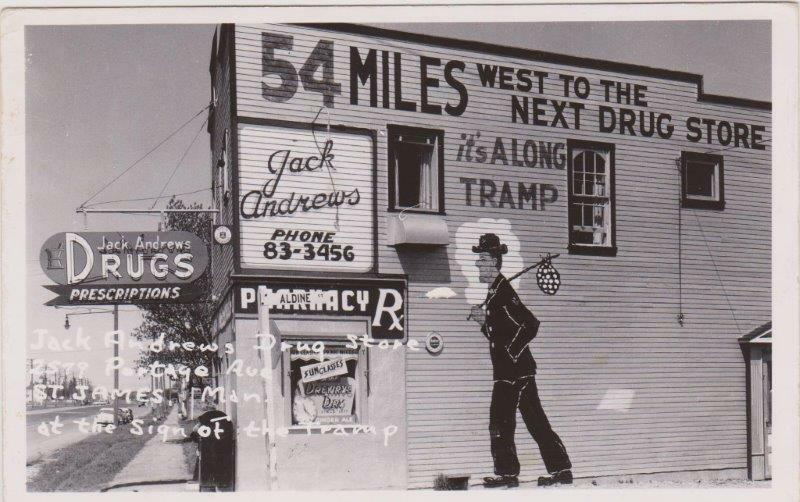 There was the old store which had a giant cartoon tramp painted on its side, which punned it was a long tramp to the next town. There was the bend in the road where the bowling alley he and his parents had had once bowled in, and the six-storey apartment block they had once lived in–the school a long cold walk across the open sports field in winter. There was another newer apartment block where a student in a band he used to go see had lived in; a handsome, funny teen who had once charged the Beatles’ plane when it stopped to refuel at the airport–a few years before the student had joined one of the country’s most famous bands (later being fired) and finally being killed as an innocent hiking-passenger in a wild car ride on the same city street late one wrong-place-at-the-wrong-time-night. There was where the bakery had been before it exploded, killing the baker and others, taking out the rest of the block’s buildings–the bakery he and his new grade 9 friends used to stop at, to eat and comically tear apart loaves of bread on their way home from school–the clothing store where his father had, on credit, bought him dark green leather loafers which never fit right and which finally fell apart–and the barber’s where he had once sat and envied the annual Export A NHL calendars of the Canadiens and Leafs on a facing wall. Beside the deathly-still vacant lot was the street where, a few houses down, he had gone to in grade 8 with an older teen to see his friend’s uncles’ two Corvettes parked on a driveway–a consummation of his private Route 66 tv show fantasies. And there, further down the main avenue, was the restaurant he had never been in, but which he would finally go into after his 40th school reunion with those same, aged grade 9 friends. And there was the supermarket where his musical friend–now a married, computer expert for another city, had once worked as a bagboy. He parked the car in the same store’s lot and went in to buy some better quality hamburger. Then he drove across the avenue to the parking lot beside the walk-up near the river where his parents still lived. The same building the big planes passed on their low descents to the airport. His folks were both well and happy to see him, much like the old Corgi cross who slowly got up from her bed. She was obviously very tired and quite ill–‘on her way out’. After supper, he went to the stove, took out a red saucepan and cooked up some of the hamburger. The dog lay motionless beside him on the floor, her head up, patiently waiting. When the meat was cooked, he put some in her yellow bowl and she limped over and tried to eat. 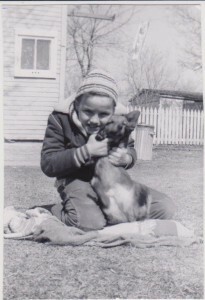 It was the least that he could do, after all this time between, for his close childhood companion. Later that evening the dog passed away quietly and the family all said goodbye to her peaceful body on the living-room floor. In the long silence that followed that evening, he thought to himself: Everything changes. Everything passes. But inside, he was still glad that he had come home, in time at last, to do one nice, last special thing for his old, never-forgotten friend.